Neglect of the cooling system is the #1 cause of expensive engine repairs. The cooling system consists of the Radiator, Water Pump, Thermostat, and Coolant/Water Mixture. Coolant is a mixture of 50% of the RIGHT coolant/anti-freeze and 50% water. Improper balance of water and coolant causes corrosion and serious problems that you cannot see. Coolant breaks down in its protective qualities with time and mileage. The cooling system must be serviced periodically to make sure the cooling system is doing as it is designed. The service intervals depend on your car, mileage and the manufacturer’s recommendations. Many auto repair companies only do a drain and refill as their coolant system service. Drain and fill leaves up to 60% of the old ineffective fluid inside. To properly service the cooling system you must use equipment to completely flush out the old fluids and replace it with all new fluids. Camarillo Car Care always recommends the proper cooling system flush and refill method. Camarillo Car Care is a strong advocate of saving your money and giving you many added benefits through proper maintenance on your cars. From our experience, the number one cause of major engine failure is cooling system problems due to neglect of the cooling system. We see some very expensive engine repairs due to this neglect – several $1,000’s is very common. Obviously, this is a very important topic for our customers. Remember, our goal is to help you prevent major breakdowns and to save you money. We do this by encouraging affordable maintenance when your car needs it. The cooling system consists of a radiator, a water pump, a thermostat and hoses. A mixture of water and coolant/anti-freeze flows through the engine, water pump, thermostat and radiator. The goal is to dissipate and remove the heat off the engine. The fluids constantly flow through the system through the radiator. The radiator uses air from the car’s motion and radiator fan to aid in the cooling of the fluids. This system sends lower temperature fluid back into the engine constantly. This keeps your engine from overheating. Overheating causes major engine damage and is very expensive. Water is a great coolant for the engine. It even does a better job than the coolant/anti-freeze itself. In fact if you wanted to cool an engine, water alone is the best method. However, there is one problem with only water: it corrodes the internal parts of the engine. 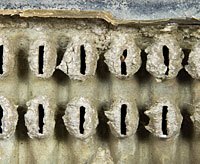 Corrosion damages many important components in the cooling system that can restrict cooling. So, we add coolant to the water to help protect the cooling system from corrosion. The coolant is also an anti-freeze formula that helps to prevent the water from freezing in your engine. 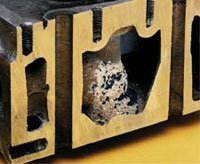 Rust, scale and sludge can plug cooling system fins, preventing proper circulation of coolant. Cooling systems are becoming more complex with later model cars. We are becoming chemists to a degree. We have to ensure that right pH, percentage of coolant additives to water ratios, and measure the presence of stray voltage (electrolysis) in the fluids. Certainly, times were more simple and easier to troubleshoot and maintain. Today, though, we must be aware of a wide variety of technologies related to cooling. We recommend and perform a visual inspection of the cooling system at each oil change service. This visual inspection consists of looking at the fluid levels and looking at the consistency of the fluid, then topping the fluid levels if needed. That is all that is needed between cooling system services. Periodically, it is important to do more than just a fluid top off. A more thorough inspection is needed. We do this periodically depending on how long and how many miles you have driven since your last cooling system service. We also factor in what your car manufacturer recommends, and the current condition of the cooling system. Additionally, we encourage more frequent thorough inspections after your car has reached 50,000 miles. Because of variables in driving conditions, the type of coolant, and your car manufacturer’s recommendations, the cooling system will need to be serviced anywhere from every two years to 100,000 miles. At our shop, we take the care to monitor this for you as you have other services performed (oil changes, etc.). We will notify you when you are due for this service. That is why it is important to have your periodic maintenance done with our shop – so we can monitor all of your maintenance issues. While some shops and quick oil change companies only drain and fill the cooling system fluids, we do the job right. The reason is that up to 60% of the contaminated fluid remains with just drain and fill. The cooling system service at Camarillo Car Care Center involves a few steps. We start by adding a chemical that breaks up the contaminants in the system. We run the car until it heats up and the thermostat opens up so fluid is running through the entire system. The job of that special additive is to rid the fluid of the contaminants and aid in the next step, the flush. We add a specified amount of fresh coolant into a specialized piece of coolant transfusion equipment and hook it up to the car. The amount we add is determined by the condition of the current fluid and the manufacturer’s recommendations. The transfusion machine forces the old fluid out completely and adds new fresh, protective fluids. After the flush equipment is disconnected, we add a conditioner. The job of the conditioner is to fortify the coolant and reduce the electrolysis. Electrolysis is an enemy of coolant, it is basically stray voltage in the system. It damages the internal parts of the cooling system if it remains unattended. We are fanatics about preventative maintenance. You might think that an auto repair shop would rather have those big ticket repairs rather than much smaller maintenance orders. Many shops do prefer repairs over maintenance. We don’t. It increases the resale value of your car. It improves your chances of selling your car later – people love cars that have been well maintained and we’ll provide you with all the receipts to help. It extends the life of your car. This can save you tremendously because you can choose freely when you want a new car, rather than being forced because of an expensive repair. It helps keep your car safer. Many maintenance items revolve around keeping your car safe, brakes are not the only thing. Steering, ABS, Axles, Alignments and more are also helpful in keeping your car safe. Not to mention, any breakdown can be unsafe when stranded on the side of a road. It helps keep your car running smoother and like new. A properly maintained car feels better. It gives you peace of mind – the most valuable benefit to you of all. You don’t have to think twice commuting to work, or taking a long trip, or a spontaneous, long Sunday drive. You feel confident in knowing your car is properly maintained and that gives you peace of mind. In the end, preventative maintenance is beneficial to both of us. Besides, we will always get those big ticket repairs because some people simply delay on maintenance until it’s too late. Hopefully, though, not you. If you would like to understand the role of preventative maintenance further, ask one of the service advisors. All of us are very experienced and well trained. And, we won’t make you feel foolish for not understanding cars either. We want you to understand because when you do, you will take better care of them.